People may be able to contract Alzheimer's during certain medical procedures in the same way as the brain disease CJD, say researchers. Contaminated surgical instruments or injections, such as human growth hormone, may pose a rare but potential risk, they speculate in Nature. The theoretical hunch comes from post-mortem brain studies in eight patients. The UK experts stress that their findings are inconclusive and do not mean Alzheimer's is infectious. People cannot catch Alzheimer's from coming into contact with other people with the condition. Alzheimer's is a type of dementia that is more common with increasing age. People with a family history of the condition are also at increased risk of developing it. 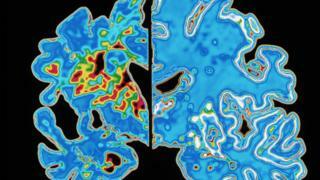 In Alzheimer's, brain cells die off and, over time, the brain shrinks, affecting many of its functions. Scientists can also see the effects of the disease under the microscope. There are two telltale signs - abnormal clusters of protein fragments, called amyloid plaques, and tangles of another protein known as tau. It was when Dr John Collinge and colleagues from University College London were studying the brains of recently deceased CJD (Creutzfeldt-Jakob disease) patients that they stumbled across one of these Alzheimer-like signs. Seven of the eight patients they studied had amyloid deposits in the brain, which was surprising given their relatively young ages (between 31 and 51) and the fact that they had no family history of Alzheimer's. All of the deceased had caught their CJD from contaminated human growth hormone injections, given to them as children. This treatment was withdrawn in the UK in 1985 once the risk of CJD infection became clear. Extra checks and measures, such as using disposable surgical instruments, are now carried out in NHS hospitals to minimise the risk. Dr Collinge believes amyloid could be spread accidentally during medical and surgical procedures in the same way as CJD, via contaminating protein "seeds" or prions that grow in the brain. Animal studies support this idea, but caution is needed. None of the eight autopsy patients had full-blown Alzheimer's disease and it is not clear if they would ever have developed dementia. There is no proof that the growth hormone injections were the cause of the amyloid. Perhaps research papers like this one should come with their own health warning: "may cause unnecessary alarm". That's not to discredit their scientific worth, the findings are interesting and important for furthering understanding. But they must be interpreted with caution. There are too many 'ifs' to draw any firm conclusions. The observations are from a small number of deceased patients who had a treatment that hasn't been used for years. Although it's still not clear exactly why some people develop Alzheimer's while others do not, experts agree that you can't "catch it" like a cold. Dr Collinge says more research is needed. He has already contacted the Department of Health to see if it has any old stocks of human growth hormone that he can check for the presence of amyloid "seeds". He said: "I do not think there is any cause for alarm. No-one should delay or not go for surgery because of this." The chief medical officer for England, Prof Dame Sally Davies, added: "I can reassure people that the NHS has extremely stringent procedures in place to minimise infection risk from surgical equipment, and patients are very well protected." Dr Eric Karran, director of research at Alzheimer's Research UK, said: "While the findings sound concerning, it's important to remember that human-derived hormone injections are no longer used and were replaced with synthetic forms since the link to CJD was discovered in the 1980s." Media captionEric Karran, Alzheimer's Research UK: "There is no data out there that people are at risk of contracting Alzheimer's disease from surgery"
"Current measures in place to limit contamination with the prion protein and minimise CJD risk from hospital procedures are very rigorous and the risk of developing CJD from surgical contamination is extremely low. "The biggest risk factor for Alzheimer's is age, along with genetic and lifestyle factors. If further research was to confirm a link between historical tissue contamination and Alzheimer's, it would only likely be relevant to a tiny proportion of the total number of people affected."